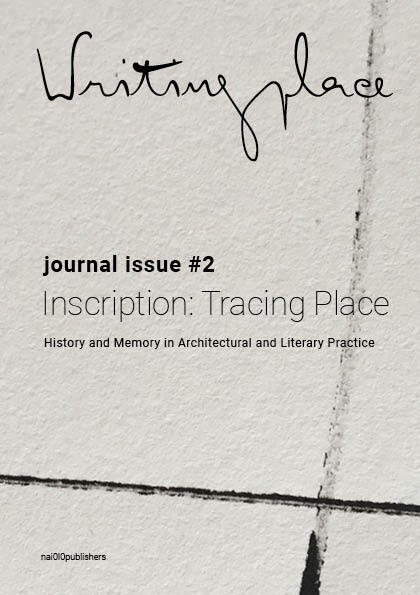 The topic of the Writingplace Journal’s second issue, Inscription: Tracing Place focuses on the role of history and memory in literary and architectural practices. The interest in memory has branched out from the overlapping of the humanities and the neuro- and social sciences to include increasingly popular forms of writing and discourse such as personal memoirs and autobiographies. Recollection, confession and being a witness help us to reflect upon the meaning of both individual and collective memory and experience. Memory and its manifestations also touch very significantly and deeply on questions of identity, of nationalism, of power and authority – issues that nowadays fracture our public space as well as our social tissue. The view that memory is factual is common. But it is also more or less common knowledge that it is or may be in part fictional, an invention in the sense that it is built upon subjective impressions, indirect and fragmented reminiscences and retellings. According to Edward W. Said, in ‘Invention, Memory and Place’: ‘To this whole matter of memory as a social, political, and historical enterprise has been added a complication . . . namely, the role of invention.’ However, even if invention assumes worrisome aspects when it comes to the utilitarian fictionalization of the past and the manipulation of the collective memory, the interplay between place, memory and invention is nevertheless the substance and condition for both literature and architecture. The philosophical thinking on the topic of place tends to adopt a similar dual perspective. On one hand, place is thought of as an empirical idea, which has a reality independent and external to human experience. On the other hand, place is thought of as a constructive product of human perception, so that without human participation, place would lose its sense and definition. In Place and Experience, the Australian philosopher Jeff Malpas emphasized this co-dependence of memory, the temporal and the spatial, on place, which held both together. As such, intangible or disembodied memory, that is memory that is unplaced, is no memory at all. This idea goes all the way back to where the thinking about space and place began in Ancient Greece (at least in written form). When Plato, in his Timaeus, gave us a speculative reconstruction of the genesis of the world, he proposed a space of becoming, chora, a kind of tea-cup model of a storm, chora dissolved into a space of completion, topos. Topos is where the whirlwind of becoming settles into a philosophical equivalent of ‘and they lived happily ever after’. Aristotle took topos a step further, defining it as the receptacle of a thing without the thing itself, a kind of negative that could locate things in their proper order. To understand this elusive idea, we might refer to the other meaning of topos, that of referring to the subject of a story or discourse. It is remarkable that, in the etymology of this word, both aspects of place manifest themselves as indissolubly linked: places can only form in things through stories entangled with them. For something to be somewhere we need a story to be able to tell about it. Similarly, all stories locate and situate themselves in a place. That is why placeless memory is such a contradictory concept. Our mind only holds half of a memory, the other half resides in the taste of the madeleine, in the building where we had coffee or in the street where he kissed her. Buildings and urban spaces become places in the stories that come to be attached to them. The writings of W.G. Sebald merge, overlap and confound fact and fiction, invention and memory, by means of document, text and image, and the relations with the events of experience and the processes of narration. Such narrative devices produce both the possibilities of communal memory and allow us to relate to as well as empathize with, regardless of being factual or fictional In Austerlitz, the featured places, seen through the eyes of the protagonist on a journey through Europe, are described with the intensity of reviving memories. Before him, Marcel Proust revealed the character of memory as deeply tied to space as to time, and the truthful possibility of a recovery of time and of self through place. Gaston Bachelard’s equally zealous explorations of intimate space in The Poetics of Space, an exploration that he himself defined as a form of ‘topophilia’, is also grounded in the concept of memory and its related phenomena. From these authors, the reader undergoes a sense of the remembered, and of the process of remembering, as experienced only in the dense materiality of places, spaces and things. These and other evocative literary descriptions bring to light aspects of atmosphere, activities, memories, rituals and emotions related to place. This issue of Writingplace seeks to investigate how literary evocations of memory can be or have been used in site analysis or architectural design. Like the tracing of history in lines and stones is depicted in the writings of contemporary authors, architects, urban planners and landscape architects, the question of local urban cultures, histories and stories may be explored with a literary lens. This approach offers the possibility to understand, not only how urban places are experienced and remembered, but also how they can be produced or transformed. In particular, this issue contains articles that identify and explore trends, authors, key concepts and theories discussed across the disciplines, thereby engaging with, interrupting, and unsettling notions of place and space, history and story. It shows how place is re-imagined and re-experienced through different practices and disciplines, both materially and through memory; how cultural, political and economic histories and stories are experienced by and inscribed upon and through place and building; how theoretical and experiential uses of place expand and challenge perception, memory and storytelling. In this issue of Writingplace, the authors look for traces of architectural memory in literary works as well as in particular cities such as Diu, Juiz de Fora, Glasgow, Ohrid, Nicosia and Bogotá. Within these contributions, we have observed three overlapping practices: reading, walking and responding. Melancholy is a key term in W.G. Sebald’s critique of the involuntary lack of mourning in Germany during the latter half of the twentieth century. This essay explores how the collective repression that Sebald identifies on a national scale is refracted in his novel Austerlitzthrough the melancholy personal history of the eponymous protagonist. Austerlitz is haunted by cryptic gaps and absences that surround the spaces of his everyday life; his unfinished history of architecture and capitalism acts as a screen on which he compulsively projects his typological interests but also as a screen that separates him from his past. For Freud, melancholia was caused by an inability to work through the effectsof trauma and loss. Scrutinizing Freud’s account of melancholia, psychoanalysts Abraham and Torok are struck by the recurrent image of an open wound that the melancholic attempts to encrypt. These melancholic encryptions originate when the unprocessed loss becomes entombed within the self, forming a crypt, a pleated fold or enclave that encapsulates the trauma. To decipher the crypt, Abraham and Torok devise a cryptonymy that combines psychoanalytic theory, literary criticism and topoanalysis. Through cryptonymy they discover that crypts leak: secrets are secreted. Austerlitz’s decisive passage back into his own transnational history as a child refugee from the Kindertransport occurs at Liverpool Street Station, a place he is compelled to revisit and where he experiences spectral manifestations of the co-existence of the past and the present. The recognition that Austerlitz experiences at Liverpool Street Station can be productively contrasted with his reaction to another significant London landmark in the novel, the Royal Observatory in Greenwich. Standing on the prime meridian that divides the globe into eastern and western hemispheres, Austerlitz explains that time was by far the most artificial of all our inventions. Rather than a linear chronology, Austerlitz posits a multi-temporal perspective from which past, present and future events co-exist in the same place. While noting how Austerlitz’s ideas intersect with other philosophical and political critiques of the limited view of history that arise from an exclusively linear progression, this essay will also pursue the more immediate example of the narrative of Austerlitz itself. For long sections of the novel the unnamed narrator repeats the digressive reminiscences relayed to him by Austerlitz, recollections frequently studded with other narratives and narrators. Through this structural framework, Sebald intimates the dislocation and fragmentation of Austerlitz’s character but also establishes a set of temporal conditions in which melancholic repetition undermines the chronological progression of history. The site-specific return of the repressed in Austerlitzreveals how the crypt of melancholy leaks: linear time collapses through the personal and collective inscription of memories and histories associated with particular places. It is difficult to envision the scope of how early European visitors of places in other parts of the world struggled to describe what they saw after their arrival. At that time, the classificatory arrangements for recounting peoples and cultures were provided by Aristotle or Herodotus. The practice of labelling and illustrating a place with words and images was made along the lines of what could be expected and known from a comparable place at ‘home’, adapting pieces to match the evident reality. This article explores the sixteenth-century spatial descriptions of Diu authored by João de Castro, Gaspar Correa and João de Barros. It seeks to analyse how these observers identified and construed knowledge about difference in the architectural and urban space of Diu and how this related to wider historical-geographical discourses of the time, when there was no clear framework of territories within which cultural artefacts could meaningfully be organized. By approaching the question of histories and stories of Diu – a place profoundly grounded in Portuguese colonial imagery – through the evocations of visual and literary memory and the understanding of the built environment, the article reveals that a crucial field of inquiry about identity and memory in colonial locations in India has gone largely unnoticed by those who construct a sense of the passage of time. Ultimately, the article claims tangible constructions as legible documents of notional constructions and discusses construction processes, materials and critical receptions as evidence of the physical’s reciprocal relationship to the conceptual construction of the East in European culture. The people’s palace, Alexandra Palace in north London, is alive with voices – redolent with the history of popular entertainment. In order to fully evoke its narrative, the writing must be too: the proposed piece uses imaginative and critical writing, historiography and creative non-fiction, demonstrating a method of re/producing place. It explores and exemplifies the use of writing inand asarchitecture, as a tool in possible regeneration through inscription of its existence in writing inspired by observation, plans and images, first-person accounts, interviews and archive work. Together the areas of writing cultivate and investigate a method based on the factual (or ‘factish’) for greater understanding of the building’s cultural recovery, recognizing the role of the fictional or speculative in regeneration. This adds practical value to the literary, as layers of expression and varied opinions and memories can feed into decisions about redevelopment under consideration. Speaking of the relationship between writing and architecture and their respective uses, Adrian Forty suggests that language makes buildings come alive, that it can ‘do things’ that buildings cannot, such as nuance, metaphor and storytelling (‘Writing Architecture?’, Royal Academy of Arts, 2014). Between evidence and imagination, this piece, rooted in the real and taking flight from it, brings these ideas together: the certainties of the material building and the multiple ‘truths’ of language. Katherine Shonfield describes ‘what happens when we accept that architecture does tangibly exist, not as a pristine impervious whole, but in the perception of the beholder’ (Walls Have Feelings: Architecture, Film and the City(London: Routledge, 2000), 160). Plurivocity, an ‘imaginative method’ of uncovering and recovering a building’s specifics, offers a response. Using excerpts from three ‘scenes’ – ‘People/Public’, ‘Lost/Missing’, ‘Found/Futures’ – that formed part of my PhD (‘Writing Alexandra Palace: Plurivocity as a method of cultural recovery of buildings’, Royal College of Art, 2016), an understanding forms of how the palace can be renewed, addressing and responding to what its publics need and want from it. The term ‘people’s palace’ is examined in relation to public space, and to the inherent contradictions of exclusion and openness in a palace, in public ownership since 1900. A consideration of what the building lacks is an essential condition for planning or conjecturing on any reinvigoration. An outline of what the palace could be for, how it could be programmed, reaches toward its next phase of existence with new and adapted suggestions for revitalization and reprogramming as a driver of regeneration. More than simply memorializing or adding forgotten strands of history, this piece examines how spaces were produced, how they exist now and how they can be renewed and transformed: looking at past, present and future. Poet Lisa Robertson’s spatial wanderings offer an account of embodied memory that is both tactical and tactile, sensuous. Taking her book-length poem Cinema of the Present(2014), we will analyse specific literary techniques that express ‘minor memories’ (minute flashes of sensorial impressions). We will also study how her lyrical approach to the urban environment contains subtle tactics of resistance. We will argue that her literary experiments can be translated into an analysis of architectural and urban space that enhances an empathetic sense of embodied community, highlighting how focusing on the sensorial affects of city living can connect us with the ‘others’ that surround us. This very tangible presence of the ‘others’ ties in with Michel de Certeau’s work. He claimed that the technocratic strategies of urban planning destroy local practices and the stories of specific spaces. Nonetheless, it is expressly these practices and stories that revive the memory of past events, of what is absent in the present – and soon prove necessary to create habitable places. Recent heritage strategies and the use of historical narratives of remembrance still run the risk of becoming a ‘strategy’: traces of the past instrumentalized in a nationalistic discourse, or the history of a neighbourhood used in a process of gentrification . . . Thereby the active engagement implied in the revolutionary part of memory gets lost. Nonetheless, some memory traces defy this recuperation and emerge as a tactic to transform space. These are precisely what we will be looking for in Robertson’s poetry. Focusing on Robertson’s polyphonic voice, we will reveal, as Certeau already acknowledged, the important role of literature in recording and even creating subtle spatial transformations: literary descriptions that allow a ‘tactical’, rather than a ‘strategic’ (that is to say, individually resistant, rather than systematic) way to appropriate urban spaces, a way to resist the controlling, normalizing strategies. This paper presents a frame for rethinking how we make cities by exploring the notion of writing beyond a literary act.To contextualize our approach and its application, we draw upon our recent Collaborative Urbanismpractice in the Scottish city of Glasgow, UK, to explore the ongoing dialogue between practice and theory in relation to city making. A significant challenge that this emerging practice seeks to address is the need for an effective and authentic method for communities and professionals to come together to co-create new public realm. To understand the perspective our practice is based on, we define two key terms. We employ the term authorshipin its broader definition to describe the state of creating or causing effect, specifically the sense of ownership and activation resulting from engaging directly with urban space. By the term inscriptive practice, we are referring to the action of a spatial practice that leads to authorship, i.e. we use collective walking as a means of inscribing urban space. We argue that collective walking when framed as an inscriptive practice enables a different type of authorship throughrather than ofthe site. Our action research area addresses the aftermath of the Modernist project to drive a motorway through the heart of Glasgow in the 1960s and therefore seeks to give people a sense of ownership of parts of the city that have become lost to public use. In this case study we use the practice of night walking to explain how walking enables us to unlock the latent identities, memories and rituals of sites for architectural design and urban choreography. Furthermore, our paper explores, when urban stories are revealed, how they can be used to change what places become in two ways. Firstly, through the act of walking as active and inscriptive in itself. Secondly, having inscribed it and enacted it these places are opened up to a dialogue that can be built upon for future uses. To conclude, we discuss our findings so far and their implications to better understand how we can work with the people of a city to read its secrets and collectively author its future.In this manner, we intend to contribute to the understanding of how collaborative, action-based research may portray and reconstruct places and provide nuanced knowledge of sites by activating them temporally prior to permanent design interventions. This article presents a journey through the divided city of Nicosia on the island of Cyprus by confronting its dominant representations in guidebooks dating back to 1960s with my personal urban experience in the northern part of the city, and placing these readings in the context of the delicate political history of the city. This approach provides an account of the extant, the constructed as well as the subjectively remembered and imagined spaces of the city. The act of reading books includes spatial and temporal activities: following the lines, stopping at certain words, jumping through paragraphs, searching for certain images and turning the pages back and forth. These activities, in the case of guidebooks, may evoke spatial memories of textures, lights, sounds, streets, buildings and people. Travelling through the different representations of sites in the guidebooks, and mapping this activity of reading, enabled me to lay out the ways in which traditional guidebooks cause a kind of topographical amnesia by privileging dominant knowledge in relation to places and decontextualizing other knowledges. I have used this multiple reading as a critical topographical practice that can question and dismantle the fixed representations in the guidebooks. Such a critical topographical practice is indeed a practice of writing place, referring to the word’s etymological meanings: toposfor ‘place’ and graphe for ‘which writes’ or ‘is written’. This topographical practice critically and subjectively relates knowledge to place and time. It offers the possibility for me – as a traveller and researcher – to temporarily appropriate real spaces and sustain other future spatial possibilities. With the following pieces of writing about sites in Nicosia, I propose possible but partial narratives of places, which are alternative to the officially acclaimed interpretations present in the guidebooks. My alternative narratives of places offer imagining the ground of the controlled buffer zone as unfixable, dead ends as spaces resisting dichotomies of centre-margin, public-private, and local-occupier, and envisioning the horizon as a continuous extension of boundaries. ‘Reading the city consists . . . [of] making the city visible through the mechanisms of language’.City and writing are intrinsically linked. As a result of man’s imagination and work, the city registers and is, at the same time, the register of human experiences. Meanwhile, we, as citizens, produce – through documents, maps, photos, diagrams, plans and, of course, literature – our own records, outlining the memory of the city. Considering this point of view, it can be noticed that the reading of the city can be done on two levels: the first one, through observation and experience in loco, in an exercise similar to that of Walter Benjamin's flaneur,who walks through the city and looks, touches, hears and smells the stories hidden in the corners and dark alleyways, always at a slow pace, denying the rhythm imposed by the traffic; the second one, through access to someone else’s records, that is, the contemplation of a painting or a photo, the analysis of documents and urbanistic drawings, the reading of a novel. This second method, much used by urbanists and architects, presents an interesting character as it is a reading of a reading: the registration of the city is never neutral; it is always accompanied by the gaze of those who write, paint or photograph, which certainly enriches the process and fills it with subjectivity. Therefore, the idea of merging both experiences (the in locoone and the reading one) was what motivated the Poetic Cartographies project, which proposed, in January 2017, a circuit of urban interventions in the city of Juiz de Fora, Brazil. The proposal presented two main goals: first, the organization of a ‘literary diagnosis’ of urban space, through the production of maps that combined concepts and themes of language and literature with the lexicon of architecture and urban design; secondly, the promotion of a reactivation of the citizens’ subjectivity, encouraging a sensitive urban walk and, simultaneously, contact with the literature inspired by and produced in Juiz de Fora. Based on the book Letters of the City(a compilation of texts and poems written by Juiz de Fora's authors, organized by Leila Barbosa and Marisa Rodrigues), the project selected pieces that were related in some way to the city centre and, through the designing and making of furniture and display devices, created a kind of urban reading room, where passers-by could have contact with the Juiz de Fora of yesterday and today, the real and the imaginary, all while experiencing the materiality of being physically in the places described. The experience produced a rich material that can be used for future interventions or designs and planted the seed for a more sensitive apprehension of our spaces, stimulating the construction of a poetic memory of Juiz de Fora. In May 2017, the project was selected for the Rethink the City exhibition, organized by the Faculty of Architecture and the Built Environment of Delft University of Technology. Renato Cordeiro Gomes, All of the Cities, the City: Literature and Urban Experience(Rio de Janeiro: Rocco, 1994), 23. Walter Benjamin, Charles Baudelaire: A Lyric Poet in the Era of High Capitalism(London: New Left Books, 1973). Leila Maria Barbosa and Maria Timponi Rodrigues, Letters of the City(Juiz de Fora: FUNALFA, 2002). In this article, poem-drawing is proposed as an emotive tool to interweave observations of place, the subjective perception of the architect, and imagined spatial interventions. A composite of two artistic instruments, allows the subjective and the objective dimension in architecture to re-establish their dialogue. In this paper, we aim to exhibit how poem-drawing can: 1. bring urban history into presence by verse-image storytelling; 2. discern how emotions (memories, desires, fears, dreams) related to a place build the urban collective memory; 3. encourage a design approach, sensitive towards the site-specific inherent beauty. Taking the old city core of Ohrid as a case study, we examined its reflection in/through the eyes of three (imaginary) interlocutors: a young pregnant woman in 1944, an eight-year-old girl in 2018 and an old lady in 2084. Through a process of poem-drawing-discussing, we tried to inhabit their personas by writing and drawing our imagined experiences of their storylines. Each cycle of poem-drawings was followed by comparison and evaluation of the written and drawn results according to their relevance for a future spatial intervention. By comparing poem-drawings from three time periods, we aimed to question whether it is possible to reveal which spatial qualities remain absolute, timeless, derived from the specificity of a particular site? With this experimental process, we aimed to find ways of tracing urban history, and to capture site-specific qualities that are difficult to measure by conventional means. By using our own embodied experience, our imagination, and by discussions on our findings, our investigation brought into play stories of the ancestors and the descendants of the citizens of Ohrid. The Architectural Embrace aims to build a metaphorical bridge between socio-economic, political and architectural contradictions in Bogotá by means of a hybrid layer – an alien object in the rigid urban grid of the city, rupturing the existing notions of what and who is valuable in the city. It thus criticizes the current and past practices of neglect and disdain towards the lowest classes of society and explores the role of architecture in challenging political and societal problems. But how does one progress in such a notorious place as El Bronx, where the urban memory is built on transgression and felt by the (architectural) uncanny without erasing the past? How does one respect and commemorate (pre-) existing conditions without dictating a collective meaning? And how does one create an architectural alternative that does not colonize the place? The Architectural Embrace approaches these paradoxes by offering a place of reflection amidst the roaring city life and its power struggles. By means of a new type of architecture, unfamiliar to and disrupting the context and its hierarchies on both urban and architectural scale, the building criticizes existing practices and paves a way toward a new perception of the location. It thus lies on the verge of the uncanny and transgressional space. In The Architectural Embrace, the city of Bogotá is presented with a monumental architecture representing the abolished fourth block of El Bronx. Instead of erasing ‘the hell of Bogotá’, it recognizes the importance of this area in the city and it emphasizes the value of the lower classes of society, while addressing the history of neglect of the location. Thus, as a tool of (and place for) reflection, the project may work as a catalyst for sustainable change and an alternative to the gentrification that brings about a vicious cycle of displacement, decay and demolition in the city. Narratives employed when writing about a place and building a place have a central theme in common: both weave between the human, personal and emotional experience of place and the physical, spatial and atmospheric place – a dialogue between the inner and outer worlds. This article builds upon a lecture given at the University of Zurich’s Department of Literature’s conference Shifting Grounds: Culture, Literature and Spatial Phenomenologies (2016), addressing several explicit uses of literature to inform the design of contemporary urban place. These uses are drawn from practical experience at Studio Vulkan Landscape Architecture, where we use literature to access a deeper understanding of how people perceive and describe their experiences of place as well as descriptions of place. The examples of literature central to our work and the accompanying projects they have informed shed light upon four facets of our contemporary urban landscape and the experience of them: 1. bodily spatial experience, 2. nature, 3. the sensory experience of being in suburban woodland fragments and 4. traffic and sound. The deadline for the submission of full papers is 14 April 2019.
and at the same time looked dragged down to societal reality. Our proposal Writing Urban Places. New Narratives of the European City has been accepted by the European network grant COST. We are much looking forward to collaborate with our international colleagues on this four-year research project, of which you will find a summary below. Last Tuesday, October 23rd, we gathered to celebrate the first two issues of the Writingplace Journal. The afternoon offers a series of inspiring talks, both about the trajectory of the Writingplace project at large, and about the content of the journal issue. Imagination can take us to unthinkable places and face a whole world that could only be dreamt of. It can take us to a city under the sea in the midst of chaos or to a tyrannical and savage empire over the clouds, in which the slaughtered are thrown from the heights above, just to fall into the ocean to a city in the midst of chaos.